Map 2 is the second board of Balloon Bash in Mario Party: Star Rush and is unlocked after players clear Map 1. The map is slightly bigger than Map 1, and it is in shape of a 2x2 window, where balloons can spawn in the corner areas of the board. 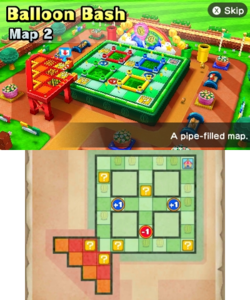 This map and Map 3 both have Shy Guy Shops, though this map has only one Shy Guy Shop, located on the upper right corner of the map. Players start out on the upper red raised platform with two ? Blocks on them; as in all Balloon Bash maps, once players leave the raised platform, they cannot return to it. Warp Pipes of different colors can be found throughout the map, serving for decorative purposes. Once players play and complete Map 2, they unlock Map 3, the final Balloon Bash map.